« Homepage / Antibacterial Drugs / "Trimethoprim"
Infectotrimet 50 mg / 100 mg / -150 mg / 200 mg tablets contain the active ingredient trimethoprim. Learn more about the applications and the action of trimethoprim below. Read also the information about the active group of sulfonamides and trimethoprim, among which the active ingredient trimethoprim. The active ingredient of trimethoprim is applied in uncomplicated case of derived urinary tract (urinary tract infections) when these are caused by trimethoprimempfindliche bacteria. Trimethoprim can be deployed also preventive in frequently recurrent bacterial urinary tract infections. The active ingredient of trimethoprim belongs to the Group of sulfonamides and trimethoprim and here to the folic acid antagonists. He has a bacterial wachstumshemmende (bacteriostatic) effect as the other representatives of its drug group. This bacteriostatic effect is based on the inhibition of the enzyme Dihydrofolsäurereduktase. Trimethoprim prevented building of folic acid vital for the pathogens in bacteria. As a result, the cell metabolism of the bacteria is disturbed and they can no longer multiply. The spectrum of trimethoprim include Gram-positive bacteria (such as Streptococcus pneumoniae) as well as many gram-negative bacteria that are often the cause of urinary tract infections (except Pseudomonas aeruginosa). It is conceivable that the drug affected the responsiveness. Active participation in road traffic and the operation of machines can be affected. On the occurrence of sore throats, fever or flu-like symptoms during the treatment with the active substance immediate blood count controls must perform, because behind an aseptic meningitis could be hiding. A regular medical examination of the liver and kidney values is recommended during treatment. Dose of the active substance for months, regular medical monitoring of doctors, including the differential blutbildes is required at four-week intervals. Strong sun or UV ground incoming radiation on the skin should be avoided during treatment. What interactions of active substance of trimethoprim in Infectotrimet are known 50 mg / 100 mg / -150 mg / 200 mg tablets? It is important to note that the interactions can be different depending on the pharmaceutical form of the drug (for example, Tablet, syringe, ointment). In combination with trimethoprim, pyrimethamine, an antibiotic and cure for malaria, can lead to changes in blood count (anemia, low number of platelets and white blood cells). The antiplatelet effect is strengthened while taking Dicoumarol and can cause more bleeding and bruises (haematomas). Cyclosporine (active ingredient used in transplants and autoimmune diseases) may cause a transient renal impairment when concurrent. Simultaneous dose of phenytoin (active ingredient against seizures) may increase the side effects of this active substance. As trimethoprim inhibits the formation of folic acid, sometimes in combination with other active ingredients, which do the same, folic acid deficiency States such as for example anaemia. This interaction can occur in combination with phenytoin, methotrexate (used in auto-immune diseases and cancer), Primidone (effective against seizures), barbiturates (sleeping and sedative) or the pain reliever Aminosalicylic. Antibiotics such as trimethoprim affect the natural intestinal flora. This can cause that active substances for the prevention of pregnancy be included no longer sufficiently into the body. Therefore, it is recommended to apply additional preventive measures for the duration of the application. The tablets should be taken whole with plenty of liquid. The dosage depends on the weight and the age of the patient. Several lower-dose pills together can be taken to achieve the desired dosage. Children under 12 years receive six milligrams of trimethoprim per kilogram of body weight a day. Adults and children 12 years of age receive 150 milligrams to 200 milligrams trimethoprim, according to a total daily dose of 300 to 400 mg trimethoprim twice a day. Prevention (prophylaxis) of other urinary infections adults and children take up once a day 100 mg of trimethoprim over twelve years. The following information about contra-indications in the application of 50 mg / 100 mg / -150 mg / 200 mg tablets in General, pregnancy & lactation, and children of Infectotrimet. It is important to note that the contra-indications can be different depending on the pharmaceutical form of the drug (for example, Tablet, syringe, ointment). When are Infectotrimet not allowed-200 mg tablets, 50 mg / 100 mg / -150 mg? The active ingredient may not apply reduction of granulocytes in the blood (granulocytopenia) or anemia megaloblastic when hypersensitivity against trimethoprim or other sulphonamides, as well as in severe renal impairment, pathological changes in blood count such as lack of platelets (thrombocytopenia). In mild renal impairment, hepatic impairment, or a lack of folic acid in the body (which is by a special form of anaemia, tingling in hands and feet felt makes) trimethoprim should be administered only after careful medical risk benefit. The Administration also only in exceptional cases and for medical observation should be in children with intellectual disability, which is related to a specific chromosome disorder (fragile x chromosome). Both during pregnancy and while breastfeeding risk and benefits of trimethoprim, an application must be examined medically carefully. As trimethoprim influenced the folic acid metabolism and studies so far does not exist, an increased risk of error formation in humans can be excluded currently not sure. The quantities of active ingredient found in breast milk of trimethoprim are low and mean no threat after previous knowledge for the infant. Preterm and newborn under six weeks trimethoprim may not receive. 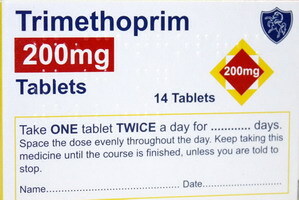 What side effects can the active ingredient of trimethoprim in Infectotrimet have 50 mg / 100 mg / -150 mg / 200 mg tablets? Below, you will learn the most important thing possible, well-known side effects of trimethoprim in Infectotrimet 50 mg-100 mg / -150 mg / 200 mg tablets. These side effects should not occur, but can. Because everyone reacts differently to medications. Please also note that the side effects in type and frequency can vary depending on the drug form of the drug (for example, Tablet, syringe, ointment). Uncommon side effects: nausea and vomiting, diarrhea, abdominal pain, bloating, appetite, fatigue, general weakness, feeling of fullness, inflammation of the mucous membrane of the mouth, tongue inflammation, rashes with itching, strange taste. Rare side effects: liver enzyme values (transaminases) increases, blood count changes such as reduction of blood platelets, reduction of white blood cells, anaemia (Methemoglobinemia), Hirnhautentzündungen, fever, creatinine valued at initial, urea value increase. Very rare and occasionally occurring side effects: skin detachment with fever (Stevens-Johnson Syndrome, Lyell Syndrome), skin schuppungen (exfoliative dermatitis), protoreaster rash, itching, increased sensitivity of the skin to sunlight, inflammation of the pancreas, temporary restriction of procreation ability in men. Specialties: Long-term use of trimethoprim seed formation disorders can occur when occasionally the man. In severe persistent diarrhea, a pseudomembranous colitis should be excluded from the doctor. Where appropriate, the active substance must be removed.